When you’re in Bali, don’t miss out on the cultural treasures and famous landscapes scattered around the island. There’s Tanah Lot Temple in Tabanan, a Monkey Forest in Ubud, and Bali Safari and Marine Park in Gianyar—who knows, you might meet your future significant other during the jungle trip, right? There’s more to KL than the Petronas Towers, and although it’s considered iconic and is well-known all over the world, Malaysia still has a lot more to offer aside from the towering view. You should try Aquaria KLCC, a world-class aquarium that showcases animals & marine life from Malaysia and around the world or, if you’re feeling a little adventurous, try hiking to Batu Cave, a limestone hill that has a series of caves and cave temples in Gombak, Selangor. Experience a blend of Eastern and Western culture once you reach China’s largest and richest city. 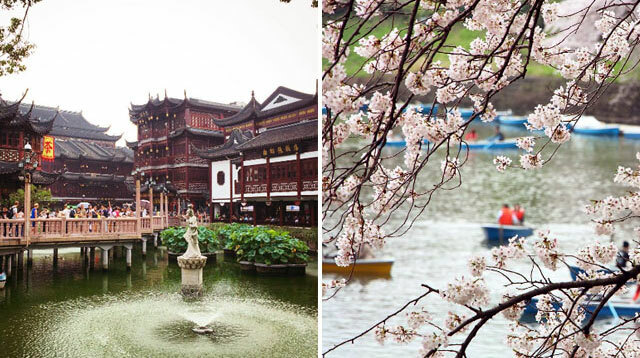 It’s modern and has a lot of tourist spots to enjoy like Zhujiajiao Water Town, an ancient town endowed with waterways, ancient bridges, and traditional Chinese-style residences; Shaghai Disneyland, and Yuyuan Happiness Garden. If you’re looking for an adventurous way to search for your special someone, visit the Marble Mountains in Da Nang, it’s a cluster of five marble and limestone hills located in Ngu Hành Son District. You also shouldn’t miss out seeing their famous landmark, the dragon bridge. Aside from the tons of makeup finds and the yummy Korean food, include Namsan Tower in your bucket list – it gives you one of the best views in Korea and is famous for its love padlocks. Maybe with your next visit you’ll seal padlocks with someone? Nepal is home to the Himalayas so if you’re up for a challenge, this is the place to be. Just make sure you hike with a group and with a legit tour guide, it won’t be any fun if you get lost in the mountains. If climbing a mountain is too much, you can visit Swapna Bagaicha, or Garden of Dreams—it’s so serene that it becomes the perfect place for deep conversations with a potential partner. What better way to meet the man of your dreams than to say your hellos along the beautiful island of Malé. Once you’ve had enough of the beach, which is very unlikely, you can visit their historic mosques and colourful skyscrapers. While seeing the famous Giza Pyramids is a must when visiting Cairo, you should also try roaming around the city to see their landscaped garden Al Azhar Park; the outstanding architecture of The Hanging Church; and the Coptic Museum which houses ancient Egyptian Christian art.